Today’s top American professional drifters compete in thousand-horsepower Formula Drift competition machines, the most powerful stock chassis racing cars on any circuit in the world. In 2004, things were a little different. Japan’s D1GP used to come over to America for driver searches, ultimately culminating in a battle of two worlds between top Japanese drivers and top American drivers at Irwindale. 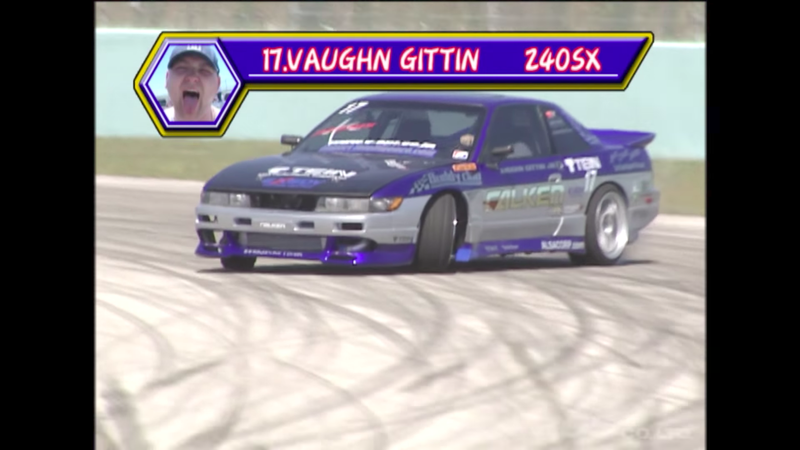 Here’s D1GP’s tour down south to Miami in 2004. That was the first year that Formula Drift started competition. The co-creators of FD had actually first brought D1GP to the United States only the year before at the end of 2003 at Irwindale. Watch this video for a pro-wrestler grade showman by the name of Vaughn Gittin Jr. (And please feel free to fast forward past the ogling shots of the grid girls.) Vaughn’s in the flashy 240SX you see above. He’d go on to win the USA vs. Japan competition in 2005, the first American to win such an event.